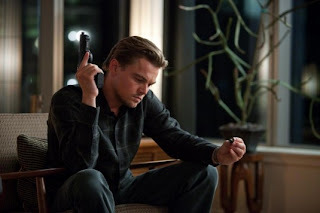 Inception is a good story that gets bloated with action-adventure on its way to a suspenseful ending. Leonardo DiCaprio is his usual wonderful self, in a young Jack Nicholson, rich man's Christian Slater kind of way. He plays a guy who can get into other people's dreams, but when he gets the final assignment of his career (which will supposedly allow him to go back to his children in America), he risks dragging down the "dream" team he assembles. Ellen Page of Juno fame is the right actor to play the architectural designer of the dreams. She also slowly unfolds the complicated, creepy, and fascinating back story of Leo and his dead (or not?) wife, played by Marilon Cotillard. Leo's wavering commitment between his wife and his team, including good performances from Tom Hardy and Joseph Gordon-Levitt, threatens their mission to successfully perform "inception," which means to place an idea in someone's head that could change their entire thinking and life course. Director Christopher Nolan can't repeat the majesty of 2000's Memento, not that anyone could reasonably ask for such a feat. However, he assembles a formidable team to try. The problem is that he gets a little too big for his britches. I seriously almost fell asleep in the middle as Leo and crew went Bond with shootouts in the rain, high-risk mountain skiing, and a very long fall off a bridge in a van. Luckily there was enough meat in the story to make this worth seeing in the theater.